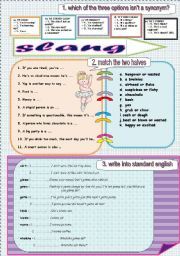 students learn about some common slang expressions. key included. Special thanks to XANI, without whose creative ideas I would have never been able to design this ws. 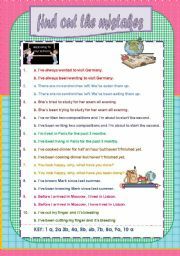 a 3-exercise ws with vocab realted to the family including not-so common family names. 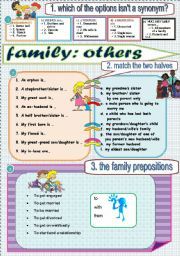 family expressions+prepositions too. foldable bookmark, very useful when speaking. 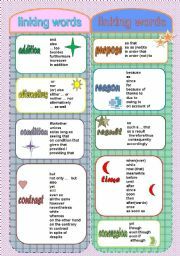 useful foldable bookmark with most common linkers to be used at writings. 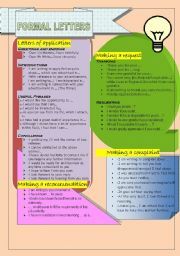 reference sheet to be used as a guide for successful story writing. 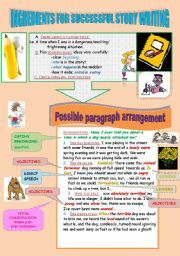 2nd page: basic picture story included for guided writing. 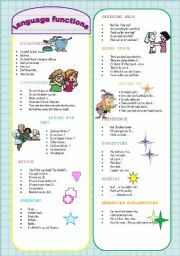 This is a two-page set of very common and useful set phrases and expresions that students may use when writing letters, both formal and informal ones. 20 questions: guess my job! Students mingle to ask their partners questions to find out their secret job. The first student to guess, wins. They then must change to interact with someone else, perhaps, choosing a new job, and asking the questions again. I´ve designed this template for teachers to fill it in with whatever we´re doing in class. It´s based on a Spanish traditional game "la oca", -the goose-, which reminds of snakes and ladders. It´s fully editable. 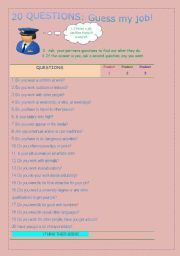 I´ve written a few example questions to let you see what it looks like. SPEAKING GAME: students move along the board, speaking about the topic of the square they land on, sometimes going forward/backward, at times getting a free candy. hope you like it!